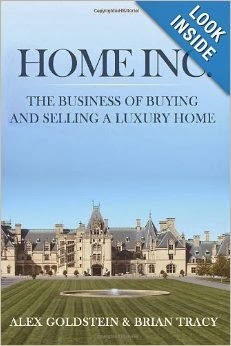 "Home Inc.: The Business of Buying and Selling a Luxury Home ," by Alex Goldstein and Brian Tracy, is a comprehensive guide on succeeding in real estate and business. The book has a conversational feel to it -- you feel like you're listening to experts speak, rather than like you're reading a textbook. Although the book is concise and to-the-point, it covers a lot of ground, from how to negotiate a deal with real estate to how to market. The book's information takes into account the fact that the market changes, which makes it applicable broadly. In addition to telling you how to achieve success, the book also tells you how to avoid failure. I love how the book's authors cover topics they are experts on. For instance, Alex Goldstein (the Arizona real estate mogul) explains how to buy real estate without an agent. Brian Tracy's chapters are more focused on general business strategies, including a strategy he created called Zero Based Thinking. Brian also explains his Brilliant Mind Storming method for generating ideas. There is also an online bonus included with the book, with great resources for applying the lesson from the book. Overall, if you want an approachable yet comprehensive book on real estate (and business in general), this book is perfect for you.